Data Free TV Requires eligible DIRECTV NOW & AT&T data services. Excl. & restr. apply. Content varies and must be streamed through the DIRECTV App. See offer details below. Its All About Satellites is your Authorized DIRECTV Dealer and we are now offering DIRECTV NOW for you in your home and on your mobile devices. DIRECTV NOW is a groundbreaking streaming. or over-the-top service, that offers residential customers up to 120+ LIVE channels of breaking news, sports and live events and 15,000+ DIRECTV NOW on demand titles – all streamed on the big screen. With DIRECTV NOW you can get live television, premium programming and On Demand content. DIRECTV NOW requires no credit check or annual contract and you can cancel at any time. 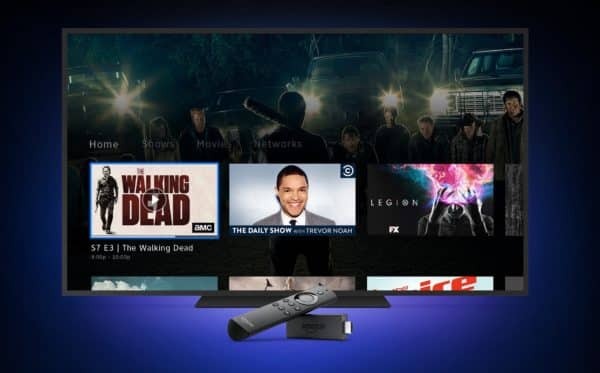 Each DIRECTV NOW account can stream on up to two devices simultaneously. Packages start at $35.00 for 60+ LIVE channels. 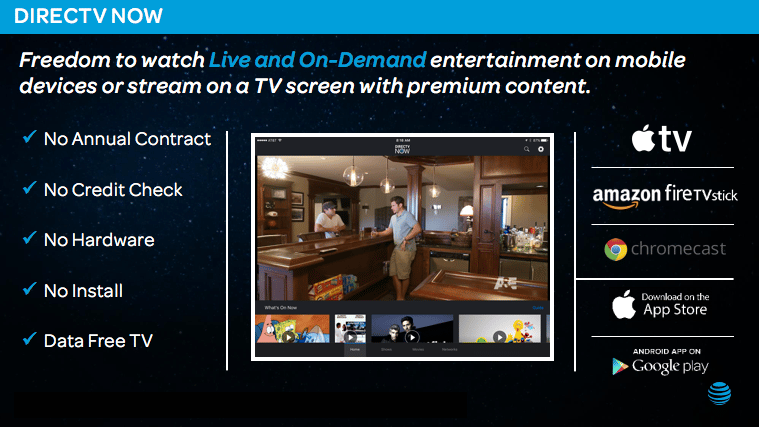 When you prepay 1 month of DIRECTV NOW, the new live-streaming TV app. *Amazon: Non-refundable. New subscribers only. See offer details below. OR Load up on HBO®, CINEMAX® or STARZ® & STARZ ENCORE℠ from $5/mo! *New subscribers only. Cancel anytime online. No refunds for partial-month periods. Auto-billed to payment method on file. See offer details. After free trial, auto-billed (min $35/mo.) unless cancelled. DIRECTV NOW: Compatible device & browser req’d. Residential customers only. Avail. in the U.S. only (excludes Puerto Rico and U.S. Virgin Islands). Free Trial: Cancel before end of trial or service renews monthly (currently min. $35/mo. ), billed to payment method on file, until you cancel. Pricing, channels, features, and terms subject to change & may be modified or discontinued at any time without notice. Live Sports & Local Channels: Limited availability. Channels vary by package & billing region. Device may need to be in billing region in order to view. Cancellation: View, modify or cancel at any time at directvnow.com. Once canceled you can access DIRECTV NOW through the remaining monthly period. No refunds or credits for any partial-month periods or unwatched content. GENERAL: Limit 2 concurrent streams per account. [AT&T data coverage & svc not avail. everywhere.] Programming subject to blackout restrictions. Taxes may apply. *Fire TV Stick: US customers only. Must prepay first month of service. Online orders will be shipped via FedEx ground to address provided. Allow 1 week for delivery. Non-refundable. Offer limited to 6 per customer. Use of the Fire TV Stick is subject to the terms found at Amazon.com. DEVICE OFFER: New residential U.S. customers only. *DIRECTV NOW: Compatible device & browser req’d. Residential customers only. Avail. in the U.S. only (excludes Puerto Rico and U.S. Virgin Islands). Svc renews monthly (currently min. $35/mo. ), billed to payment method on file, until you cancel. Pricing, channels, features, and terms subject to change & may be modified or discontinued at any time without notice. Live Sports & Local Channels: Limited availability. Channels vary by package & billing region. Device may need to be in billing region in order to view. Cancellation: View, modify or cancel at any time at directvnow.com. Once canceled you can access DIRECTV NOW through the remaining monthly period. No refunds or credits for any partial-month periods or unwatched content. GENERAL: Limit 2 concurrent streams per account. [AT&T data coverage & svc not avail. everywhere.] Programming subject to blackout restrictions. Taxes may apply.